Can you help to identify the unidentified nurses? A black and white photograph of School of Nursing Graduates at the Ontario Hospital Whitby. 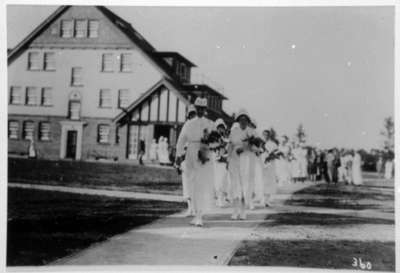 This picture shows Director of Nursing, Miss Gertrude Bryan, leading the graduation procession past the nurses' residence. School of Nursing Graduates, Ontario Hospital Whitby, c.1924, Photographer Unknown. Whitby Archives 13-001-196.